Background and aim: Mesenchymal stem cells (MSCs) are capable of impacting tumor progression but its role in tumor stroma remodeling still remains unclear. This present study was aimed to evaluate the potential function of MSCs on tumor stroma remodeling using rabbits VX2 bladder tumor model. Methods: The VX2 bladder tumor models were established by injecting mixed cell suspensions (106 of VX2 tumor cells and 0/106/107 of autologous MSCs in group A, B, C, respectively) into the bladder mucosa using thirty male New Zealand white rabbits. The tumor volume was measured by ultrasound at the time points of 1st, 2nd, 3rd and 4th week after inoculation. At the end of the fourth week, the tumor tissue expressions of basic fibroblast growth factor (bFGF), transforming growth factor beta 1 (TGFβ-1), hepatocyte growth factor (HGF), matrix metalloproteinase 2 (MMP2) and matrix metalloproteinase 9 (MMP9) were determined using Real-time quantitative PCR and immunohistochemistry. Masson trichrome staining and Cy3-FITC double-labelled immunofluorescence staining were used to determine the MSCs distribution in tumor tissue in another two rabbits implanted with a cell suspension of 106 VX2 tumor cells and 106 autologous MSCs. Results: MSCs were homogeneously distributed in tumor tissues after 7 days of inoculation, which were not consistent with the distribution of tumor stroma. After 21 days of inoculation, MSCs have been integrated into tumor interstitial tissue and mainly distributed in the mesenchyma around the tumor nest. At the 1st, 2nd, 3rd and 4th week time point, tumor volume in group A < group B < group C, and the difference has statistical significance (all p<0.001).The relative mRNA and protein levels of bFGF, TGFβ-1 and HGF were significantly higher in group B and C compared with group A (all p<0.05), as well as the mRNA levels of bFGF, HGF were higher in group C than group B (p<0.05), and the protein levels of bFGF, TGFβ-1 were higher in group C than group B (p<0.05). The mRNA and protein levels of MMP2 were significantly higher in group B, C than group A (p<0.05). MMP9 was increasingly over expressed along with the growing amount of MSCs inoculated within tumor, both at the level of mRNA and protein (all p<0.05). Conclusion: MSCs participate in tumor stroma remodeling via inducing overexpression of some important growth factors and MMPs. Stem cells have extraordinary potential for differentiation and proliferation. The transplantation of stem cells to repair or replace dysfunctional tissues and organs has been becoming a new hot spot. Mesenchymal stem cells (MSCs) are characterized by high plasticity, rapid expansion in vitro, low immunogenicity, stable genetic background, easily availability, as well as avoiding the tumorigenicity, immune rejection and ethic controversy of embryonic stem cells. Therefore, MSCs has been widely used in stem cell transplantation. As to how target organs induce stem cell migration, it is generally demonstrated that extracellular signals expressed by damaged organs regulate this process. Further differentiation of transplanted MSCs shows the characteristic of environmental dependence after stem cells migrate to the target organs. Different microenvironments can induce stem cells to different directions. For example, MSCs differentiate into hepatocytes after they are implanted in the liver . In the traumatic microenvironment MSCs can differentiate into myofibroblasts which promote wound repair . As a rapidly growing and metabolically active lesions, tumor should also be able to induce stem cells differentiating into cell types conducive to tumor growth and development theoretically. Current researches have shown that tumor do have the capacity to accumulate MSCs and induce MSCs to migrate into tumor tissues [3, 4]. In fact, there are two completely contrary directions about the effects of MSCs on tumor growth and metastasis: One is that MSCs can promote the growth and metastasis of tumor [5-8], while the other is that MSCs can inhibit the growth and metastasis of tumor [9-11]. But the vast majority of these studies are the results of in vitro cell experiments or immunodeficient mice, and the MSCs used are allogeneic. Therefore, the effect of autologous MSCs on autologous tumor in a normal living is not clear at present. It is considered that tumor growth and development are closely related to the remodeling and activation of tumor interstitial microenvironment [12, 13]. Activated mesenchymal cells produce a large number of extracellular matrix components, growth factors and matrix remodeling proteins, forming a microenvironment conducive to tumor growth and proliferation. In this present study, we assume that autologous MSCs enhance tumor growth by means of affecting tumor stroma remodeling. And we validate this hypothesis by monitoring the expression of relevant growth factors and matrix metalloproteinases (MMPs) in rabbit VX2 bladder tumors which are inoculated with different amount of autologous MSCs. Thirty two male New Zealand white rabbits (weight 1.5-2.0kg) were obtained from Shandong Academy of Agricultural Sciences. The animal protocols were approved by the Institutional Animal Care and Use Committee of Shandong University School of Medicine. Surgery was performed under sodium pentobarbital anesthesia, and all efforts were made to minimize suffering. The study designs. 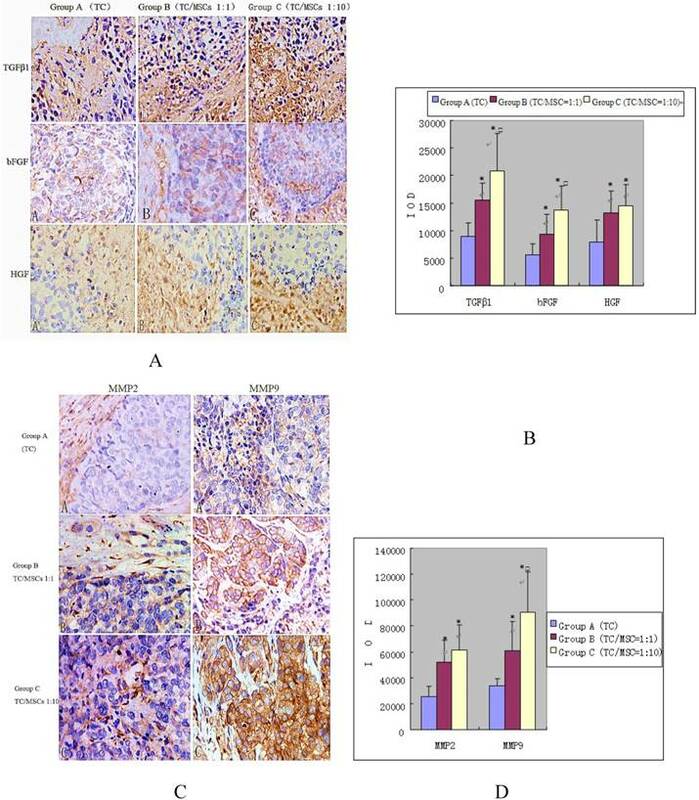 30 rabbits were used to find the influence of MSCs on VX2 tumor growth and expression of bFGF, TGFβ-1, HGF, MMP2, MMP9, two rabbits were used to find the distribution of MSCs in VX2 tumor tissue. Rabbits were anesthetized using intravenous injections of pentobarbital sodium (1mg/Kg, 3%). Bone marrow aspirates were obtained from the proximal tibia of each individual rabbit via bone marrow aspiration. The aspirates were mixed with an equal volume phosphate buffered saline (PBS) and centrifuged at room temperature (1200 r/min × 5 minutes). The sediments were suspended in 5 ml PBS, then added carefully into a centrifuge tube containing 4 ml of Percoll (specific weight 1.073g/ml, Huajing, China) and centrifuged (2000 r/min × 20 minutes). MSCs in the interlayer were suspended in 6 ml of PBS and centrifuged (1200 r/min × 5 minutes). After discarding the supernatant, the sediments were suspended in 6 ml PBS and centrifuged at 1000 r/min and 800 r/min for 5 minutes respectively for purification. In a density of 2.0×105/cm, the cells were finally suspended in dulbecco's modified eagle medium-low glucose (DMEM-LG) (Gibco, USA) supplemented with 10% calf-serum, 10 U/ml penicillin G and 10 µg/ml streptomycin and cultured in 25-cm2 flasks at 37°C in a humidified atmosphere containing 5%CO2. The non-adherent cells were removed after 72 hours and the medium was changed every 3 days. When the cells grew to 80% confluence, they were subcultured by treatment with 0.25% trypsin (Sigma, USA) for 5 minutes at 37°C. Trypsinization was discontinued with the addition of 10 ml DMEM-LG. The cells were further expanded with 1:2 splitting. Flow cytometry was performed to identify F2 passage MSCs by testing for CD34, CD44 and CD45 (Serotec, UK). MSCs with CD34(-), CD44(+) and CD45(-) were used for study. 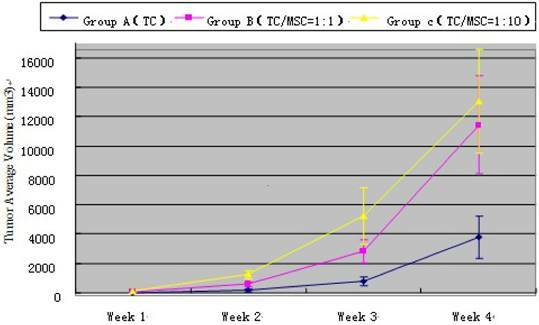 Finally, MSCs were harvested with 0.25% trypsin, washed with PBS, adjusted to a density of 5×107/ml and reserved for spare. Pour DMEM in the culture bottles, add 3.5 ml 50ml/L DAPI (Sigma, USA) , incubate for 1 hour at 37℃ away from light; DMEM without serum wash for 6 times to remove unconjugated DAPI; 0.25% typsin digest for 5 min, add complete DMEM to end difestion, blunt and blend; centrifugate at 1500r/min for 5min, pour supernatant , add DMEM without serum, mix, modulate cell density to 5×107/ml, put on ice at least 1 hour on standby. VX2 tumor is a kind of squamous cell carcinoma derived from a Shope virus-induced papilloma . Generally the tumor mass can be detected by ultrasound scanning one week after inoculation, lymph node metastasis will occur three weeks after inoculation, and lung and liver metastasis will occur three or four weeks after inoculation. Due to its continuous tumor growth, metastasis and stable biological characteristics, VX2 bladder tumor is a suitable model for our study. After anesthesia had been induced on the carrier rabbit (presented by Radiology Department of Qilu Hospital) as described earlier, we shaved and sterilized the tumor region, and the tumor was surgically exposed. We obtained the tissue from the edge of the tumor which was vigorously grown. All procedures above were under sterile conditions. After douching the tumor tissue with PBS three times, we trimmed off all fibrous tissues and clipped the tumor tissue into 1mm3 masses. We digested the masses with trypsin and Collagenase Ⅰ (0.1%, Gibico, USA) for 20 minutes at 37°C and then filtered impurities with a 200 mesh screen. After being centrifuged (800r/min × 5 minutes), the tumor cells were homogenized and made into a cellular suspension. Cell cultures were grown at 37°C in 5% CO2 using 1640 medium (Gibco, USA) supplemented with 15% calf serum and 10 U/ml penicillin G and 10 µg/ml streptomycin. The non-adherent cells were removed after 72 hours and half of the culture media was changed every 3 days. The cells were harvested with 0.25% trypsin as above, washed with 1640 medium, and adjusted to a density of 1×107/ml. We prepared mixed cell suspensions which were 300μl in total volume with autologous MSCs, VX2 tumor cells and PBS for each group as follows: Group A:106VX2 (100μl)+PBS (200μl); Group B:106VX2 (100μl)+106MSCs (20μl)+PBS (180μl); Group C:106VX2 (100μl)+107MSCs (200μl). We established tumor model by means of injecting mixed cell suspensions under the bladder mucosa. After the exposure of the urinary bladder through the lower abdominal incision under sterile conditions, we made a small incision (0.8cm) in the bladder wall, and inoculated the cell suspension into the bladder wall perpendicular to the incision. Then bladder wall and abdominal wall were stitched in turn. Multisection ultrasound scanning was conducted 7, 14, 21, 28d respectively after cell inoculation to monitor tumor occurrence and growth. The tumor growth curve was set up and inguinal lymph nodes metastasis was observed to compare tumor progression in 3 groups. All animals were sacrificed at 4 weeks point. Bladder tumor specimens were obtained to make paraffin sections, and distant organ metastasis was recorded. Frozen sections of 4 ~ 8um were made from tumor tissue. After keeping at room temperature away from light for 30min, 4℃ pure acetone was used to fix them for 30min. After washing with PBS for 5 minutes× 3, 1:20 PBS normal serum blocking solution was added on them, and placed them at room temperature for 10min.Then the redudant liquid was thrown away without washing. The 1:200 / PBS diluted mouse anti-α-SMA (Boster, China) was added on the sections, and placed them for 1 ~ 2 hours under 20-37 ℃, or under 4 ℃ overnight. Then 0.01M PBS was used to wash them for 2min × 3. 1:100 / PBS diluted biotinylated antibody (Boster, China) was added on the sections, and placed them for 30min under 20-37 ℃. Then 0.01M PBS was used to wash them for 2min × 3. 1:100 /PBS diluted Cy3 (Boster, China) was added on the sections, and placed them for 30min under 20-37 ℃. Then 0.01M PBS was used to wash them for 5min ×4. The 1:200 / PBS diluted mouse anti- Vimentin (Boster, China) was added on the sections, and placed them for 1 ~ 2 hours under 20-37 ℃, or under 4 ℃ overnight. Then 0.01M PBS was used to wash them for 2min × 3. 1:100 / PBS diluted biotinylated secondary antibodies (Boster, China) was added on the sections, and placed them for 30min under 20-37 ℃. Then 0.01M PBS was used to wash them for 2min × 3. At last, 1:100 / PBS diluted FITC (Boster, China) was added on the sections, and placed them for 30min under 20-37 ℃. Then 0.01M PBS was used to wash them for 5min × 4. The sections were sealed by water-soluble mounting, and observed with Fluorescence microscope. We chopped tumor specimens (100mg) in eppendorf tubes (1.5ml), and total RNA was extracted by the TRIzol method (Invitrogen, USA). Total RNA (1μg) was reverse transcribed using ExScripTM reverse transcriptase kit (TAKARA, Japan) in a 20μl reaction according to the manufacturer's protocol. Real-time PCR involved use of Light Cycler 2.0 System (Roche, Mannheim, Germany) with the SYBR Primix Ex TaqTM kit (Takara, Japan). The primers were designed using Primer Premier 5.0 on the basis of mRNA sequences from the GeneBank database (Table 1). All analyses of relative quantification were performed using the 2-ΔCΔCt method with β-actin as a normalizing gene . The immunohistochemical kit was from Boster, China. All obtained bladder tumor specimens were fixed in 4% paraformaldehyde for subsequent embedding in paraffin. Successive paraffin sections (4μm) were made from the tumor specimens. The sections were dewaxed, rehydrated, and then microwaved (92°C-98°C) for 10-15 minutes in a sodium citrate buffer to retrieve antigen epitopes. Endogenous peroxidase activity was suppressed by 3% H2O2 and blocked by 10% goat serum. Diluted primary antibodies against matrix metalloproteinase 2 (MMP2 1:400), matrix metalloproteinase 9 (MMP9 1:400), basic fibroblast growth factor (bFGF 1:500), transforming growth factor beta (TGFβ-1 1:100), hepatocyte growth factor (HGF 1:100) (Millipore, USA) were added and left at 4°C overnight. As secondary reagents, we use biotin labeled secondary antibody for 20 minutes at 37°C. Afterwards we infilled SABC (Boster, China) for another 20 minutes at 37°C followed by staining with DAB reagent (Boster, China) until a brown color developed. Slides were counterstained with hematoxylin and differentiated in hydrochloric acid ethanol. Cell nuclei were stained blue using PBS. Sections were dehydrated and a transparent coverslip was added to enable observation by microscopy. IOD (intergrated optical density) was measured for semi-quantitative analysis for the intensity of immunohistochemistry. All images were analyzed by Image-Pro Plus 5.0. Sequences of primers of target genes and β-actin. All values are expressed as the mean ± standard deviation (SD). The one-way ANOVA and Student-Newman-Keuls test were used to determine statistical differences between two groups and multiple comparisons, respectively, with P<0.05 considered significant. At the 1st, 2nd, 3rd and 4th week time point, tumor volume measured by ultrasound in group A < group B < group C, and the difference has statistical significance (all p<0.001) (Table 2). Tumor growth curve showed that MSCs could promote VX2 bladder tumor growth (Figure 2). The weight of bladder tumor at 4th week was 4.0 ± 1.2 g, 11.3 ± 3.5 g, 12.8 ± 3.9g in group A, B, C respectively. Animals in group A did not present inguinal lymph node metastasis (ILNM) in the first 3 weeks, ILNM appeared in 3(3/10) rabbits at the 4th week point. Animals in group B did not present ILNM in first 2 weeks, 3(3/10) rabbits showed ILNM at 3rd week point, and 7(7/10) rabbits showed ILNM at 4th week point. 5 (5/10) rabbits in group C appeared ILNM at 3rd week point and 8 (8/10) rabbits showed ILNM at 4th week point. Bladder tumor could be found in all animals when they were sacrificed at 4th week point, and generated tumor approximately were regular and most are round in shape. No obvious satellite focus was found. Two rabbits implanted with a cell suspension of 106 VX2 tumor cells and 106 DAPI labeled MSCs were sacrificed at 7 days and 21 days after cell inoculation. We found that MSCs were homogeneously distributed in tumor tissues after 7 days of inoculation, which were not consistent with the distribution of tumor stroma (Figure 3 A and B). After 21 days of inoculation, MSCs have been integrated into tumor interstitial tissue (Figure 3 C and D). Cy3-FITC double-labeled immunofluorescence staining also showed that DAPI-labeled MSCs were mainly distributed in the mesenchyma around the tumor nest after 21 days of inoculation (Figure 4). The mRNA expression levels of bFGF, TGFβ-1, HGF in group B were 3.250±0.587, 2.970±0.490, 2.101±0.527 respectively, which were all significantly higher compared with group A (1.087±0.194, 1.134±0.165, 1.185±0.247) (all p <0.05). The levels of these three growth factors in group C were 3.620±0.670, 3.651±0.744, 3.052±0.438 respectively, the values were all higher than those in group A (all p<0.05). The expression levels of bFGF and HGF mRNA in group C were statistically higher than those in group B (p<0.05) (Figure 5). # The estimated tumor volume calculation formula: 4π(diameter/2)3/3. * P <0.05: statistically different compared with group A. 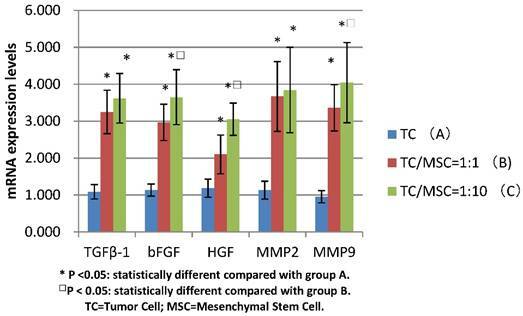 □P < 0.05: statistically different compared with group B.
TC=Tumor Cell; MSC=Mesenchymal Stem Cell. Tumor average volume of all three groups at different time point. TC=Tumor Cell; MSC=Mesenchymal Stem Cell. Two rabbits implanted with a cell suspension of 106 VX2 tumor cells and 106 DAPI labeled MSCs were sacrificed at 7 days and 21 days after cell inoculation. The obtained tumor tissue was subjected to continuous frozen sections. In the two adjacent slices, one masson trichrome staining revealed that the mesenchyma was blue around the tumor cell nest, and the other observed the distribution of DAPI-labeled MSCs in the tumor tissue under fluorescence microscopy. We found that MSCs were homogeneously distributed in tumor tissues after 7 days of inoculation, which were not consistent with the distribution of tumor stroma (Figure A and B). After 21 days of inoculation, the distribution of MSCs in tumor tissue was consistent with that of tumor interstitium, and the polarity of MSCs was consistent with that of myofibroblasts in tumor interstitium, suggesting that MSCs had been integrated into tumor interstitial tissue (Figure C and D). Cy3-FITC double-labeled immunofluorescence staining showed that the expression of α-SMA and Vimentin were positive in mesenchyma around the tumor cell nest after 21 days of inoculation, and DAPI-labeled MSCs were mainly distributed in the mesenchyma around the nest. We detected increased mRNA expression level of MMP2 in group A, B and C successively (1.134±0.243, 3.67±0.945, 3.845±1.159), we found the levels of group B and C were significantly higher than those of group A (p<0.05), while there was no statistical difference between group B and C. The same tendency was detected in the MMP9 mRNA expression levels of these three groups (0.955±0.166, 3.360±0.628, 4.045±1.084), with great statistical difference among them (all p<0.05) (Figure 5). Expression of growth factors (bFGF, TGFβ-1, HGF) was detected in interstitial cells (fibroblast cells, endothelial cells, inflammatory cells) and tumor cells. The IOD values of these three growth factors in group B were 15396.10 ± 3230.57, 9280.66 ± 3754.99, 13203.17 ± 3990.86, all significantly higher than the values in group A, which were 8948.70±2462.91, 5632.70±1943.18, 7824.43±4077.94 respectively, (all p<0.05). Group C demonstrated higher levels of growth factors: (20875.40±6737.11, 13811.14±4311.62, 14523.69±3865.41), all notably higher than that in group A (all p<0.05). While the expression of bFGF and TGFβ-1 in group C was higher compared with group B (p<0.05), there was no statistical difference of HGF expression between the two groups (Figure 6 A and B). Immunohistochemical staining of growth factors (A and B) and MMPS (C and D) in bladder tumor of three groups. We can find the impact of MSCs to the expression of growth factors and MMPS in bladder tumor. Positive expression was detected in interstitial cells (fibroblast cells, endothelial cells, inflammatory cells) and tumor cells, especially where tumor actively proliferated. Group A, B, C were implanted VX2 tumor cell suspensions, VX2 tumor cells and MSCs suspensions (1:1), VX2 tumor cells and MSCs suspensions (1:10) respectively. Image magnifications are 200×. * P <0.05: statistically different compared with group A. □P < 0.05: statistically different compared with group B. Positive expression of MMPs was also demonstrated in interstitial cells and tumor cells, especially where tumor actively proliferated. The IOD values of MMP2 increased progressively in group A, B and C (25337.20±8151.51, 51507.50±17679.55, 61535.66 ±19449.11). Significant differences were found between group B, C and A, (p<0.05), while no statistical difference was found between group B and C. The IOD values of MMP9 were 34172.91±5243.75, 60582.28±22975.45, 90287.45±31362.21 for group A, B and C respectively. The values of group B and C were remarkably higher than that of group A (p<0.05), and group C was higher than group B (p=0.024) (Figure 6 C and D). In the past decade, several studies have reported that MSCs could stimulate tumor growth in many kinds of tumors: colon cancer, melanoma, breast cancer and prostate cancer, et al [6, 16-18]. Although certain assumptions have been made, the specific mechanism still remains unclear. As is widely known, tumor stroma remodeling is an indispensable step for tumor growth and development [19, 20], and our previous study demonstrated that most MSCs were distributed in the tumor stroma . Thus, we think MSCs may facilitate tumor growth by accelerating the progress of tumor stroma remodeling. To further investigate this hypothesis, we inoculated VX2 tumor cells into rabbit bladder wall with different amount of self MSCs, and focused on the alterations of specific growth factors and MMPs which represent remodeling of tumor stroma and activation of tumor microenvironment. TGFβ-1, bFGF and HGF are significant growth factors secreted by tumor stroma cells, which play a great role in tumor remodeling. TGFβ-1 and its receptors provide a supportive role in tumor incidence and progression. Furthermore, TGFβ-1 assists in tumor invasion and metastasis by immunosuppression, promoting angiogenesis and inducing formation of extracellular matrix (ECM) [22-24]. One of the most powerful angiogenesis factor is bFGF which can stimulate the proliferation of a wide range of cells . It is synthesized mainly by stromal fibroblasts and functions in both an autocrine and paracrine fashion . It can also promote cell motility and proliferation, and increase tumor angiogenesis and inhibit apoptosis . HGF is a growth factor that modulates the motility and stable interaction of epithelial cells and signal pathways mediated by it, which has a significant meaning for progression and prognosis of tumors . The degradation of extracellular matrix (ECM) is the prerequisite and foundation of tumor invasion and metastasis. MMPs are the most important ECM degrading enzymes. MMPs can destroy the degradation balance of stroma and accelerate the degradation of stroma to promote tumor cells breaking through the histological barriers, further obtaining access of invasion and metastasis. Overexpression of MMPs greatly influences the growth, infiltration and metastasis of tumor. Biopsy observations indicate that in most malignant tumors, besides tumor cells themselves, MMPs are mainly from tumor stromal cells, especially fibroblasts . In all MMPs, MMP2 and MMP9 are especially important. MMP2 is also known as gelatinase A, and MMP9 as gelatinase B. Both of them have a close relationship with the ability of cell infiltration and play a key role in the process of tumor invasion and metastasis . Just like MMP-mediated tissue remodeling is the mechanism that MSCs use to regenerate damaged tissue , MSCs also induce over-expression of MMPs in the tumor microenvironment, to further remodel tumor stroma and form a hospitable microenvironment for tumor growth and development and, in turn, promote tumor invasion and metastasis. In this study, we established rabbit VX2 bladder tumor model via co-injecting cell suspensions (106VX2 tumor cells with 0/106/107 MSCs) under the bladder mucosa in three groups respectively and monitored the expression alteration of bFGF, TGFβ-1, HGF, MMP2 and MMP9. We found that along with the growing amount of MSCs inoculated with tumor cells, all growth factors and MMPs above increasingly over-expressed both at the level of mRNA and protein. This indicates that MSCs do facilitate the progress of tumor stroma remodeling. Mishra et al reported MSCs can be persuaded by tumor cells to become phenotype turncoats, morphing into carcinoma-associated fibroblasts that actually support tumorigenesis , which is consistent with the results of our previous investigations . Thus, we believe that, in the tumor microenvironment, MSCs may participate in tumor stroma remodeling by differentiating into fibroblasts or so called MSC-derived stromal cells. These cells and other interstitial stromal cells secrete local high concentration of bFGF, TGFβ-1 and HGF, as well as induce over-expression of MMP2 and MMP9. All of the above constitute a suitable tumor stroma microenvironment conducive to tumor growth, invasion and metastasis. Mesenchymal stem cells are involved in the tumor stroma remodelling by inducing over-expression of some important growth factors and MMPs in tumor microenvironment. This process might be one mechanism that MSCs promote tumor growth and metastasis. MSCs: mesenchymal stem cells; bFGF: basic fibroblast growth factor; TGFβ-1: transforming growth factor beta-1; HGF: hepatocyte growth factor; MMP2: matrix metalloproteinase 2; MMP9: matrix metalloproteinase 9; PBS: phosphate buffered saline; DMEM-LG: dulbecco's modified eagle medium-low glucose; IOD: intergrated optical density; ILNM: inguinal lymph node metastasis. This work was supported by National Natural Science Foundation of China grant (no.30900549), Natural Science Foundation of Shan Dong Province grant (no.ZR2009CQ026), Shandong provincial key research and development plan (no. 2017GSF218008), and Scientific research start fund of Qilu Hospital (Qingdao) of Shandong University (no. QDKY2016ZD04). This manuscript was modified by Sam Hobel from University of California, Los Angeles. JC, LM and QW designed and coordinated the study. YZ did animal experiments, flow cytometry work, KZ carried out the Immunochemistry and RT-PCR assay. LM and NZ analyzed data and wrote the paper. ZX contributed experimental design and data analysis. All authors read and approved the final manuscript.